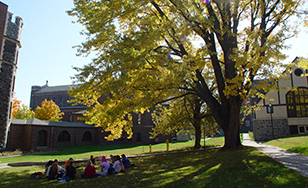 St. Scholastica has been named one of Forbes magazine's Top Colleges for 2015. The magazine says its rankings are determined by an analysis of five outcome-based factors: student satisfaction, post-graduate success, student debt, graduation rate, and academic success. Fewer than half of 1,400 colleges examined for these rankings made the final list of 650. St. Scholastica ranked no. 404 on the final list. The rankings were compiled by the Center for College Affordability and Productivity. Based in Washington, D.C., the CCAP was founded in 2006 with a goal of researching costs and efficiency in higher education to facilitate a broader dialogue. "We are pleased to earn this recognition by Forbes' Top Colleges," said Beth Domholdt, St. Scholastica's vice president for academic affairs, "representing as it does the academic and post-graduation success of our students as well as their satisfaction with the education they receive at The College of St. Scholastica." "This is a new age of return-on-investment education, the very heart of our definitive ranking," Forbes magazine says on its website. "We ignore the abstract (reputation) and wasteful (spending-per-student) to focus on one measurement: outcome. From career success to student debt, this rank counts what matters." According to the most recent statistics compiled by St. Scholastica's Career Services center, 97 percent of 2014 graduates were employed, enrolled in graduate school or serving in the military or post-college volunteer service within six months of graduation. The College offers a guarantee that all new students who enter as first-year undergraduates and follow a few basic academic guidelines will graduate in four years.